To use a weather station with this interface, click the Add button on the Configure Ports tab. The port editing dialog will appear. 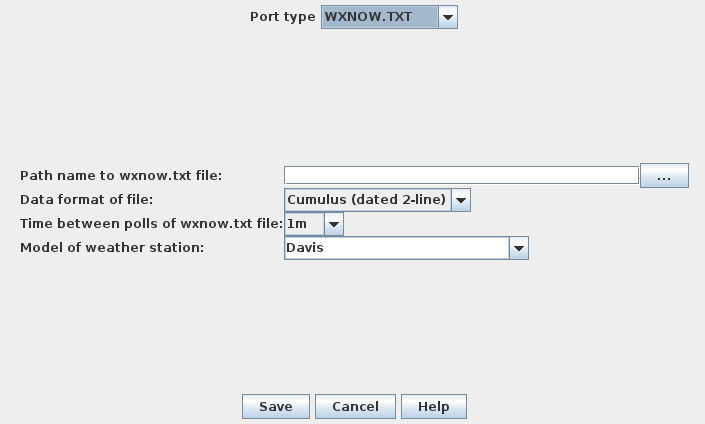 Set the port type to WXNOW.TXT. the complete path name of the WXNOW.TXT file, including the path to the directory containing the file. the time period between checks of the file for updated weather data. The make and model of weather station you are using. Once you have the settings the way you want them, click OK.
You can check how well your weather station is performing by selecting the menu choice View->Show Weather Status.